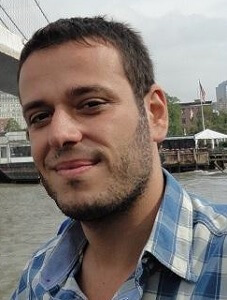 Alexandros Kostopoulos was born and raised in Athens, Greece. He obtained his Diploma from the Directing Department of Film and TV School of L. Stavrakos, Athens, Greece. He also obtained his doctorate degree in Informatics, from Athens University of Economics and Business. He is member of the Scriptwriters’ Guild of Greece and Greek Directors’ Guild. He wrote the screenplay and directed several short films. Moreover, he participated in several short films as editor and assistant director. He also participated as assistant editor in the TV show “The Book”, broadcasted by NERIT (the main Greek public channel), directed by Antonis Kokkinos and Yannis Soldatos, in 2015. During his school years, he wrote and directed the theatrical play “The new adventures of Antigoni”. Br(e)aking Point, screenplay, 2018. 2nd Best Original Short Film Script at the 5th Greek Script Competition of the Scriptwriters’ Guild of Greece. Moreover, it was selected by Drama Pitching Mini Talent Lab in the 41st International Short Film Festival in Drama, and Olympia “Creative Ideas” Pitching Lab in the 21st Olympia International Film Festival for Children and Young People. Step into my shows, short film, directed by Alexandros Kostopoulos, 2014. The first voyage of Ulysses, screenplay, 2017. The new adventures of Antigoni, directed by Alexandros Kostopoulos, 2001. “Special prize” in the Greek Student Theatrical and Ancient Theater Festival.